Everyone wants to conserve energy in their homes. Phoenix is a very hot city. Summer starts in April and, if we’re lucky, ends in October. Homes and buildings want to conserve as much energy as they possible can. Insulating windows and doors is the common action that everyone in Phoenix does. Little did they know that 25% of heat is lost through the roof. By heat, we mean the temperature that house is trying to conserve. During the brutal summers, the citizens of Phoenix have their air conditions at 75 degrees at the most. In order to contain that 25% of energy in the house, is by contracting a foam roofing company. When a foam roof contractor is inspecting your house, he/she is taking a note if your roof is flat or sloped. If you have a flat roof, the following is what you need to know about flat foam roofing. Before we explain the importance and benefits of a flat foam roof, first we are going to explain two layers of it. A flat roof is composed of two separate parts. The layer that protects your roof from water and humidity is the felt paper and tar layer. The second layer, elastomeric, protects the felt paper and tar from ultraviolet radiation. These two layers are important when trying to conserve the energy of the house. However, that is not enough to prevent cool or heat from escaping your house and using more energy to keep your home cool or warm. To decrease the possibility of energy escaping through your roof, installing spray foam roofing in Phoenix is the next logical step. Once you have installed that foam, the following advice need to be considered. The main reason why you are have a flat foam roof is to conserve energy and protect your home. Having the best quality foam coating is essential. With the best quality, it’s a guarantee that the foam will last about a decade. A foam coat will prevent your roof from developing water leaks and will sustain it free from mold and other major damages that a roof is exposed to. Ask the flat roofing contractor about the chemicals that the foam coating has, and make sure it has at least one pound of titanium dioxide per gallon, which has sun-blocking properties. Having the best quality foam coating for your home will guaranteed to protect your home. The only requirement is that you have to maintain it clean and make minor, necessary foam roofing repairs in Phoenix before completely re-coating your roof again with foam. Not cleaning the gutters or removing debris from the roof will lead to damages. 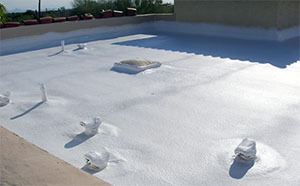 Spray foam roofing in Phoenix is very durable and strong. However, if you let water and debris build up on the foam, that's when cracks and blisters will be appear. Instead of having a minor repair on your roof, you risked the possibility of leaks in our ceiling and mold growing on your roof. By doing simple maintenance and repairs to your roof, the quality of the foam will stand until proper recoating is necessary. If these two advices are taken seriously, the quality of your roof will last for one decade, the average duration of a foam roof. The maintenance alone is a lot of work. Everyone is busy with work, school, meeting deadlines, taking care of kids, doing chores around the house, and among other activities carried out every day. People compliant and lack on maintaining a well, adequate lawn, let alone the roof of the house. The roof is a very important element in the anatomy of the house, beside the foundation. Grab a ladder and examine the roof before mowing the lawn. Phoenix is a desert, there are hardly any trees and the gutters don’t get disgustingly dirty. Plus, if you do a monthly inspection of your flat foam roof, it will save money on the long run. The chance of finding any damages in the first five years is very slight. If you happened to spot a minor damage, a simple repair is all that it needs. The foam is very durable and it will last 10 years, if it’s well maintain. Remember a foam roof is protection from the sun’s harmful UV radiation, wind, moisture and other elements that the roof exposed to. These elements will slowly, very slowly, degeneration the condition of the foam. Which is why the repairs are very important. If you are looking for a Phoenix foam roofing contractor, contact us. 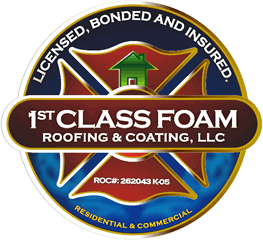 1st Class Foam Roofing & Coating will answer any questions or concerns that you may have.